Decorating a bookshelf seems pretty easy. You just fill it up with books...right? Not so fast! There's a lot more to a well-styled bookshelf than meets the eye. But don't be intimidated—decorating a bookshelf is a great way to express some creativity and flex your styling muscles. Here are some tips for decorating a bookshelf—inside and out! The number one item is, obviously, books. Old, new, large, small, hardcover, paperback—no matter what they look like books are always great. 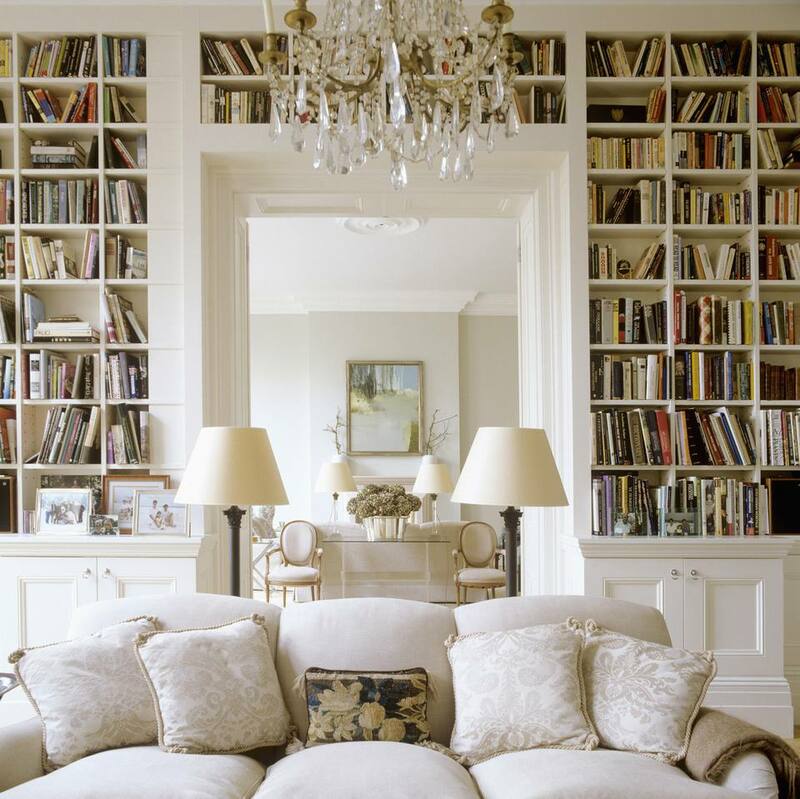 Remember if you're using a large number of books to vary the way you display them. Have some displayed vertically and some displayed horizontally to create a bit of visual interest. Bookshelves are great places to display small pieces of art, such as paintings. Depending on their size you can layer them in front of books, or lean them against the back of the shelf and layer smaller items in front. Small photo frames can be easily layered in front of books to create depth and add a personal touch. Keep in mind that they look best when placed between waist-height and eye-level. Never put them too high or too low. And try to avoid using too many, as small frames tend to look cluttered when several are grouped together. No more than three per shelf (unless your shelf spans the length of the room, in which case you can use more). Baskets are fantastic for bookshelves because they fill a lot of space, and they can hold a lot of stuff. As a general rule they look best near the bottom of shelving units, plus it makes them easier to access. Decorative boxes are the go-to accessory for designers and stylists looking to fill empty spaces. They come in a huge variety of colors and materials, so no matter what your style you can find something to suit your shelves. Don't be afraid to stack them or layer items on top. Composition is something that a lot of people have trouble with. No matter what you put on your shelves the key is to make sure that items relate to each other in some way, be it through color, style, theme, or some combination of all three. Remember, making multiple items work together is about thinking of them as a single unit. Displays should never be one-dimensional, so be sure to layer a few items in front of each other. Put the tallest items in the back and the smallest ones in front. This could mean layering some little decorative objects in front of books or placing books in front of a piece of art. Don't be afraid to partially hide some things, because what you can't see from one angle you'll be able to see from another. No matter whether you're styling a bookshelf, coffee table, or mantle, it's important to find balance. You don't want anything really big that will overwhelm the space, nor do you want anything teeny tiny that will get lost. Vary the shapes, sizes, and heights of all the items, but try to keep them in relation to each other. A little bit of contrast is important in all aspects of decorating. When things are too similar they can become flat. So always try to add a little contrast, be it through color, material or shape. So for instance, if you have a stack of square or rectangular boxes, add a little rounded object on top. Or if you have a collection of leather-bound books, add a decorative object or piece of art made of glass or metal (ie—mixing soft materials with hard). It doesn't have to be major—a little contrast goes a long way. If your bookshelf is looking a little tired and you want to spruce it up a bit consider these DIY upgrades. Wallpaper is a great way to spruce up the inside of a bookshelf. It can add color and pattern and, depending on what style you choose, highlight items on the shelves. The easiest way to install it is to cut pieces of foam core so that they fit snuggly between the shelves, then glue the paper to the foam core instead of directly to the back of the shelf. You can simply slide the papered foam core into place, and easily remove it if you decide later that you want a change. It will slide right out without damaging the back of the shelves. Paint is the upcycler's best friend. No matter what material your shelf is made of, with a little prep work it can easily be fixed up with paint. You can give it a complete overhaul, just paint the interior or exterior, or try some sort of pattern. Whatever your style, paint can do wonders. Decoupage isn't just for kids! Beautiful pieces can be created by decoupaging paper onto case goods. Use your imagination and look for wrapping paper, maps, portions of wallpaper, or any other paper goods you can find to create a unique look. Try decoupaging the interior, the exterior, or just the shelves. Just be sure to find something that compliments the existing piece and the rest of the room. Get creative and try something fun! Applying nailhead trim to casegoods is a terrific furniture hack. It used to be reserved just for upholstery and soft furnishings, but in recent years it's become trendy to add nailhead trim to harder surfaces (bookshelves, end tables, closet doors, etc.). For a simple look try applying it around the edges, or for something more decorative try creating a unique or intricate pattern. If you're very confident you can use tacks that are nailed directly into the piece, but if you're not quite as sure you can use adhesive strips.